From January 4 - 5, 2016, Cape Cod and eastern Massachusetts dealt with enhanced snow bands, driven by anomalously warm ocean temperatures just off the coast. While several inches of snow on the Cape is nothing out of the ordinary, what is unusual is that Boston and areas in eastern MA just 10 miles away from the coastline measured much less! What could be the culprit here? GFS modeled surface temperatures for 00Z (7PM) on Monday, January 4, 2016 (courtesy Levi Cowan / Tropical Tidbits). Note air temperatures in the 20s passing just off the Massachusetts coast. Ocean effect snow is your answer! The physics are actually largely similar to lake-effect snow, featuring cold air moving over much warmer water. With ocean temperatures in the 45-48 degree range off the coast, and air temperatures in the upper 20s, the 20 degree difference creates an unstable atmosphere in the lowest 4,000-5,000 feet. This unstable atmosphere leads to the development of snow bands, some of which could produce moderate to heavy snowfall rates. In fact, the sea surface temperatures just off the coast are running 2.0-2.5 degrees Celsius above normal, which helps increase the instability even more. Image displaying Sea Surface Temperature anomalies off the MA coast on December 31, 2015 (courtesy NOAA). Yellow color corresponds to 1.75 to 2.5 degrees Celsius above normal. But why does ocean effect snow primarily impact the Cape? It all has to do with the wind direction. 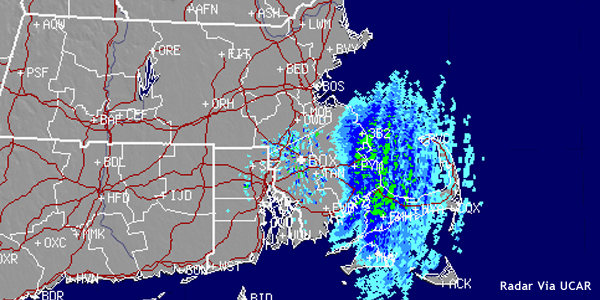 Very cold winds out of the north are notorious for developing snow bands over the ocean and tossing them right over the Cape. If the wind shifts a bit to the northeast, some of these bands are able to move further inland. See the image from the high resolution NAM model for tonight (courtesy of the PSU e-wall), showing the expected placement of ocean snow bands. So next time ocean effect snow is predicted, you'll understand why this phenomena occurs. And if you forget, just search out this useful explainer.